I was looking through my cell phone games the other day for the first time while in the dentist’s waiting room. Nothing really interested me much until I came upon a welcome sight. My mobile had Tetris, which is quite possibly the most long-lasting, entertaining old school console games every created. Tetris has remained wildly popular, though not in a chic kind of way. It more has to do with the staying power of the game itself, and the comfortable familiarity that puts it on the highest ‘classic’ tier. This has been reflected in the wide number of products inspired by the game that have hit the market in recent years. Here are a few personal favorites, some of which are available for purchase. Who doesn’t love a good meal? Now here is a better question: who doesn’t love a good meal on a set of Tetris blocks? This interesting table was designed and created by Jared Kohn. While it isn’t the most attractive piece of furniture you could own, it is pretty cool. I would recommend it for the ultimate geek-room accessory, wherever you keep models, console or collectables. If you talk to your plants, coo to them as you mist them, or spend more time with them than you do most friends, you are probably a garden lover. 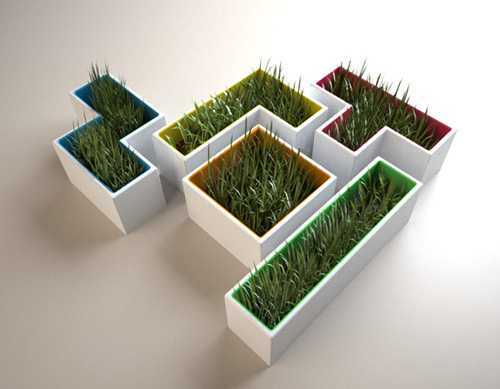 If you want some interesting planters for indoors or out, why not get some that grow your plants in the shape of the well known Tetris blocks? They were created by students at the Estonian Academy of Arts, and they are fantastic. However, they wouldn’t be great for most plants, given the narrow shape. 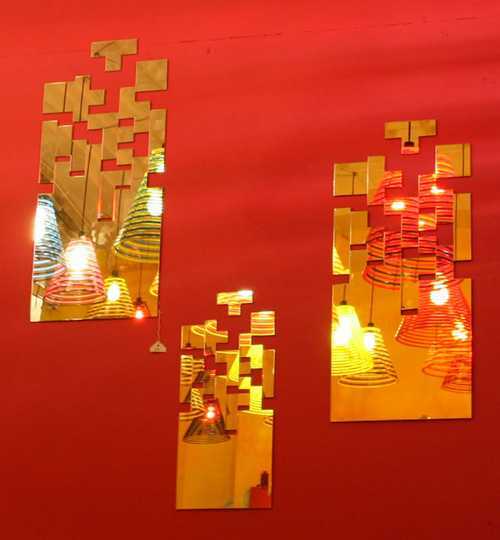 Probably the most creative idea I have seen using the Tetris model, these gorgeous mirrors have both nerd appeal and modern art appeal. 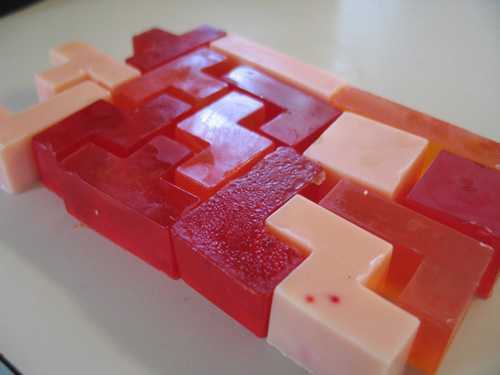 They are attractive acrylic mirrors made up of thirteen panels that have been formed in Tetris bricks. The bottom is solid, showing where the levels were complete. They stick to the wall using double sided sticky pads. Is there anything better than a drink at the end of a hard day at work? 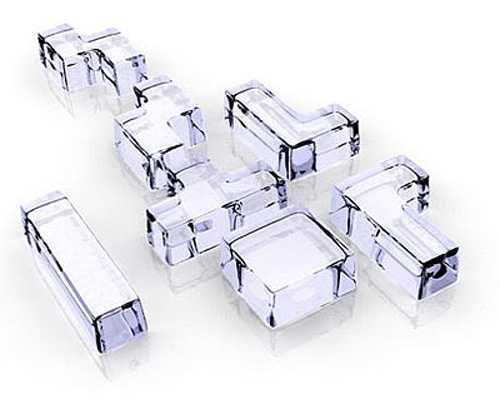 Whether it is a scotch on the rocks or a glass of lemonade, you can spice up that beverage with these Tetris ice trays. They are provided by the ever thoughtful Think Geek, and they are made of silicone. 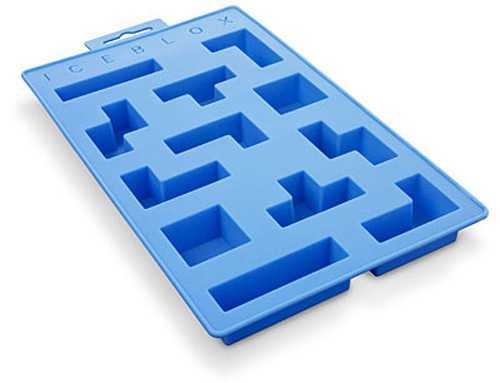 This makes the tray flexible, which is easier to get the ice from. The unusual shape would make it ore likely to snap the tray in half if it were plastic. 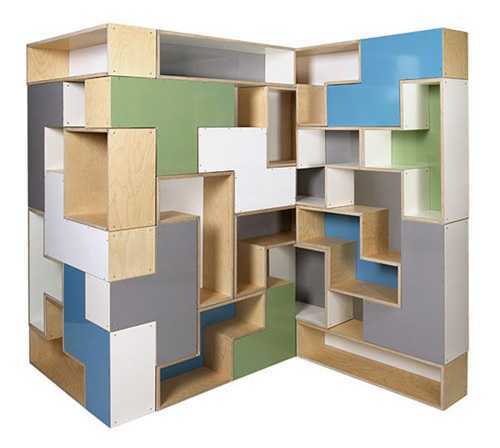 These modular shelves are as functional as they are interesting. The plywood boxes are each made in block shapes, which can then be constructed together and hung, like in the game. You can actually stack a lot of them, making something closer to a standing bookshelf, or else hung more casually for whatever it is you might need them for, without the clutter. 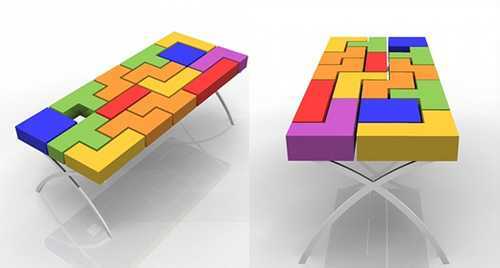 You can find more Tetris related furniture, such as an awesome desk setup, by artists Diego Silverio and Helder Filipov here. 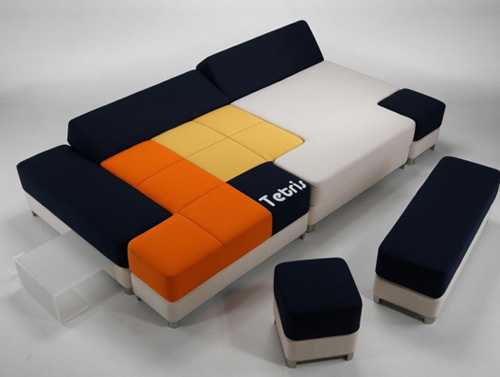 Stefano Grasselli created this cool, multilayer couch that can be mixed and matched to fit your preferences. 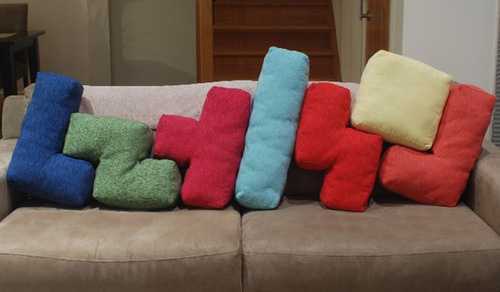 There are different shapes and sizes, with the cushions matching each block found in the game. This will definitely cause some conversation. Turn a boring couch to a fab affair with these cushions! They are a little weirdly colored to me, but the fabric used is gorgeous. It is a natural, soft cotton, and the cushions themselves are very comfortable. They are also easy to organize on any sized sofa or chair. If you are looking for some home décor ideas, this might be just the thing for you. 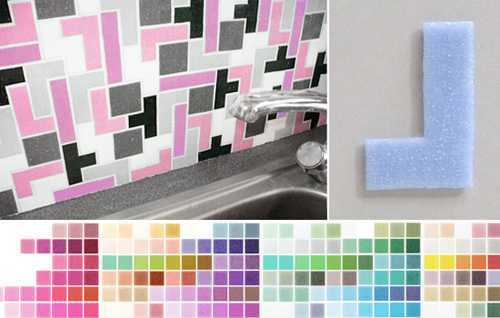 These tiles are well made, interesting, come in multiple colors and are easy to install. You can create a pattern in the mosaic, or else create an entire game screen to enjoy. They are high quality, so no fear of shipping or scratching. Take your geekiness to work! This Tetris tie is actually one of many classic game inspired pieces. There is one with a joystick, Asteroids, Pong and Space Invaders. Each one costs between $18.95 and $20.00, and they are available on Amazon. 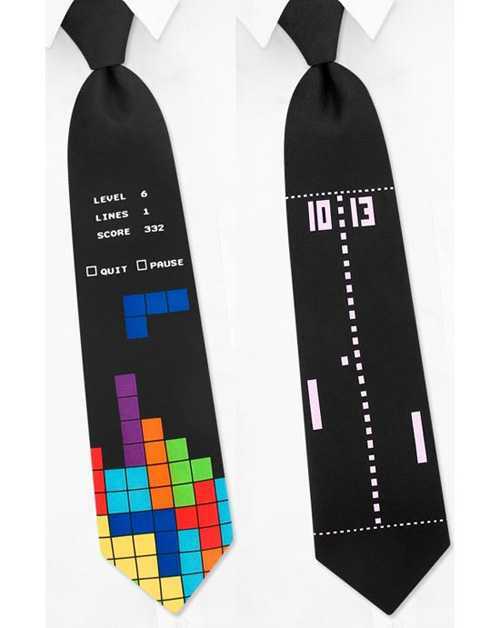 The tetris products are great but that pong tie is awesome. 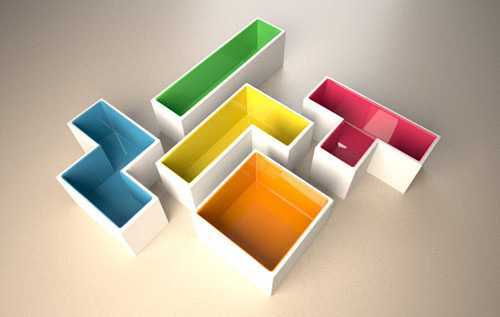 The tetris shelf and table are amazing! Where could I get those?